This literature review is the second in a series commissioned by CASJE. 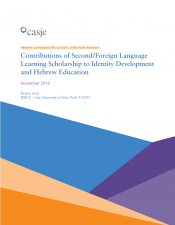 These reviews explore the implications and applications to the teaching and learning of Hebrew of recent research in heritage, second, and foreign language learning. Sharon Avni, the author of this second review, is Associate Professor of ESL and Linguistics at BMCC - City University of New York (CUNY).